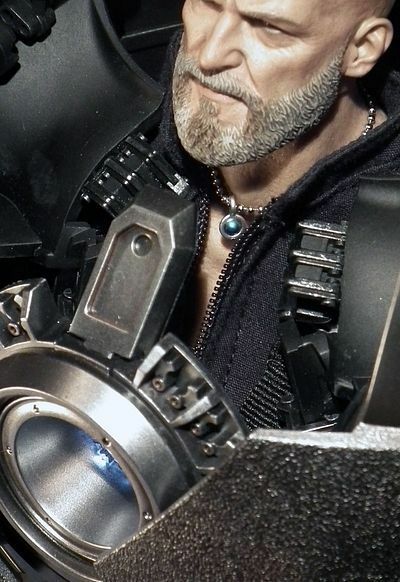 Jeff Parker checks in with a look at one on of the best figures from Hot Toys last year - take it away, Jeff! The more 1/6th obsessed of you out there might be aware that Mr Michael Crawford, Eamon O’Donoghue, James Doble and my good self (Jeff Parker) have in the last few months started a recording a podcast, available on iTunes here. In it, we discuss our mutual love of all things cool from the 1/6th (and occasionally other scales) arena. The last episode was an extended ‘Christmas/New Year Special’, though you’ll hear no jingle bells from us, ho, freakin ho, ho! Being our last discussion of the year we decided to do a quick roundup of all the figures we have been most impressed with this during the past twelve months. We all agreed that Sideshow continued to impress with their Star Wars line (IG-88 was a favourite), ENTERBAYS new work at ¼ scale was worthy of note, and we all shared a love of Hot Toys offerings like Captain America (rescue version), Luke Skywalker DX (something almost approaching a bargain) The Samurai Predator (just too awesome not to get a mention) and the two fantastic figures of the Batman and Joker from Tim Burton’s seminal 1989 movie. All… I think you will agree are good enough in their own rights to walk off with the prize of top figure of the year (depending on your sensibilities). However, for me, a late arrival, that I was lucky enough to get hold of on Christmas eve, managed to push ahead of the competition. This was partly due to his impressive size, but cemented my a great sculpt, a cool paint app and quite frankly an astounding degree of toy engineering! 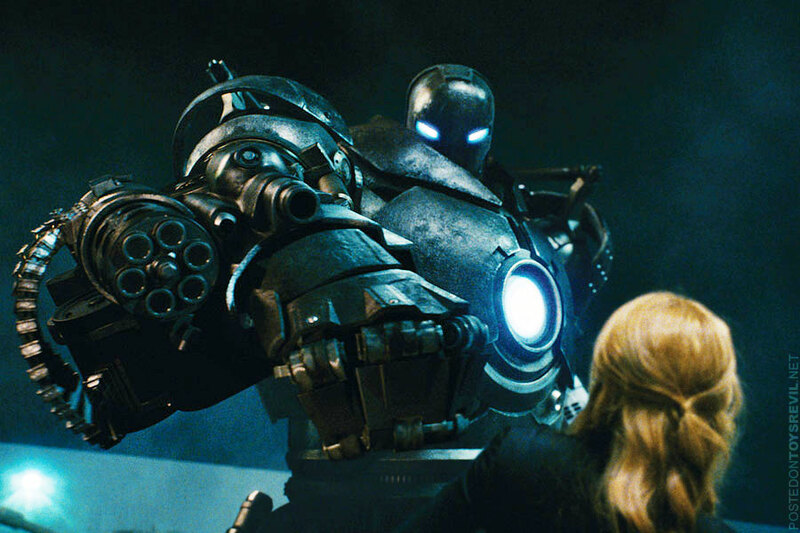 Ladies and gentlemen, I give you the Iron Monger! OK, the judging on the Poppies hasn’t even started yet (at the time of writing), and with the massed ranks of fans, bloggers, artists and industry insiders it could go in any direction… and it probably will. But for me this guy has stolen the show, will he prove as popular with you guys? 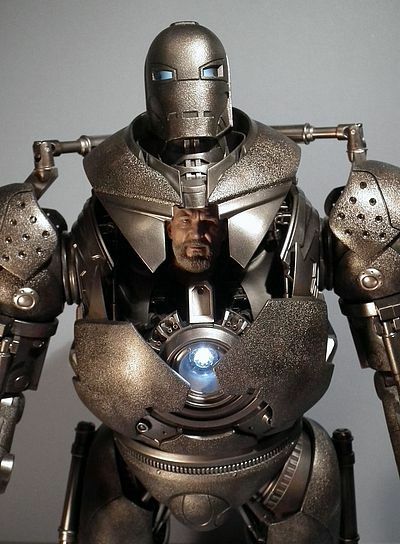 We all know that Hot Toys are capable of some astounding work for their packaging, but sometimes, when the contents get bulky they eschew glamour in favour of practicality. That’s not to say this isn’t an attractive box, but it certainly lacks the impact of some of their finest work. Firstly you are met with the shipping carton, which thoughtfully has a plastic carry-handle on the top, making this look like a rather low-spec briefcase. Carefully cut open the tape running up the side and you can slip out the large grey rectangular shaped box with a ‘polarised’ duotone illustration of the figure on the front and enticing shiny foil blocked lettering spelling out the characters name. Now open up this box and you can get access to the Styrofoam inner tray that houses the main figure and his various accessories. So, a well thought through carton that answers its particular brief well insomuch as it gets this bulky critter to you in one piece! And even though I’m liking the boxes overall design it isn’t exciting me in the way some of their previous designs for this series have. But once we get to the contents… well, then the excitement level ramps up! I’m constantly impressed with the ever-improving output of high-end 1/6th figures we get from the top manufacturers these days. Yes it’s my job to critique their output, but as a fan I can also get giddy with excitement when some figures arrive, and this guy had me enthusing like an over excited school boy (I know this because that’s what my wife called me!). Once you have peeled away the layers of packaging and you finally lift this guy out of his tray you will start to understand why everyone that owns this thing enthuses so very much… it is a work of ART I tells ya! Firstly lets get the portrait of Jeff Bridges out of the way, not that I want to dismiss it! Hell no, this is a beautifully rendered sculpt, and manages to capture just the right look of intense, concentrated rage, and is the work of KoJun. Unlike the version we got of Bridges as Kevin Flynn in Tron (which was by Jeon Young Tae, under the direction of KoJun), this version does not have his trademark flowing locks. No, this version is balder than the proverbial coot, but still manages to slightly improve upon that earlier version. The only hair here is instead evident on his chin, as his full beard is beautifully rendered, with each whisker being distinctly evident. The rest of the head is well proportioned, and shows all the usual attention to fine detail on the wrinkles and pores. 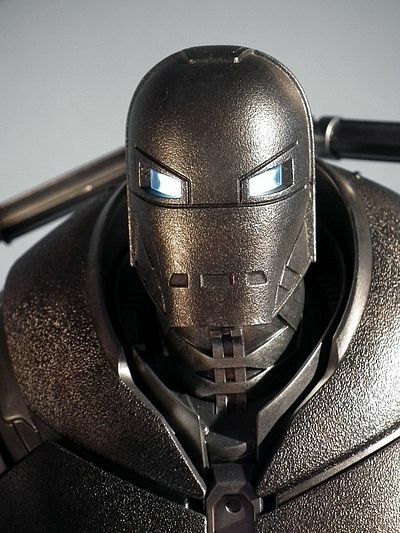 You will be pleased to know that the head is of the usual design where it joins the neck-post, meaning you could swap it out for any other head should you be inclined… but more importantly it means you can create a separate Obadiah figure if you have a spare True-Type or 1/6th business suit lying about. 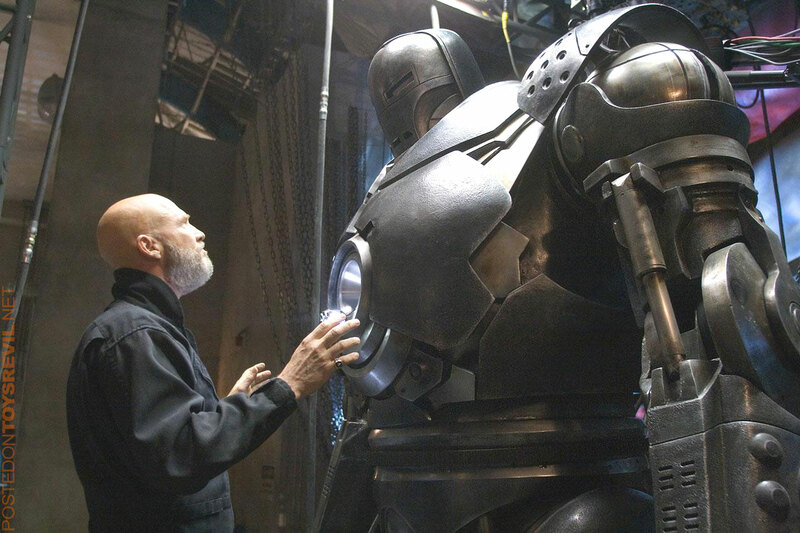 Now onto the armoured exoskeletal suit, and boy what a suit! 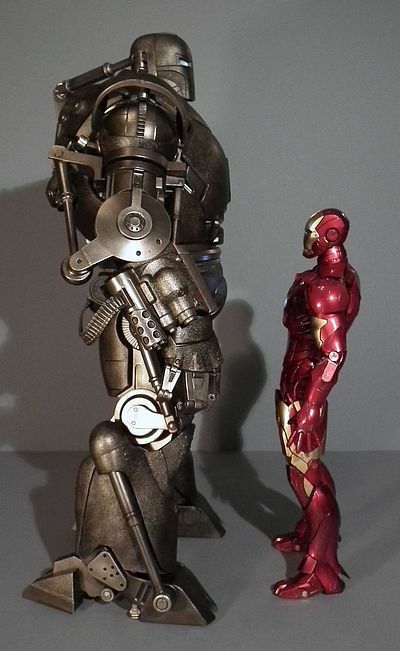 As I already stated this thing is big, measuring in at a fraction under 18” from top to bottom, and like the previous versions of the power-suits there are elements where the sculpt, outfit and articulation are intrinsically linked, as all three categories merge into one. 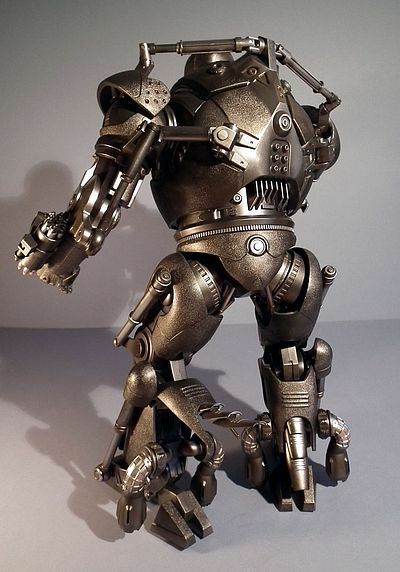 I guess you could say there is no actual ‘outfit’ as it is all sculpted, and the sculpting takes its form because of the engineering required to make it posable. And what we end up with is a supremely well-observed rendition of the character as we saw him in the movie. I Googled a few images, viewable here, here, here, and here just to jog your memory, and it will make it evident just how well put together this baby is. The outer shell is textured to look like rough cast wrought iron, with its heavy pitted surface having a coarse feel to the touch. 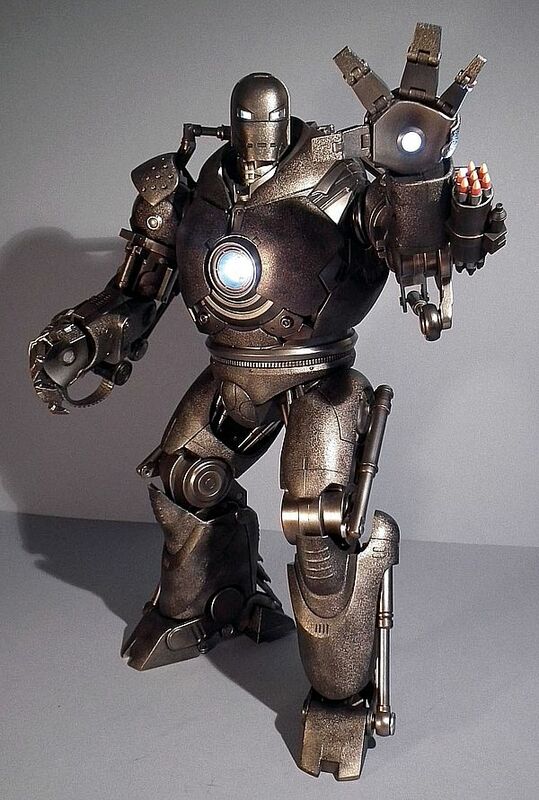 Between the textured panels are the joints and engineered working pistons that really bring this figure to life. These areas are smoother, allowing the pistons to slide where needed and to swivel and rotate on universal, pinned and ball-joints. The whole thing is an elegantly executed mess of articulation, and I recommend that you sit quietly with this guy for a good few moments just gently manipulating the joints and experimenting with the way everything aligns and functions. 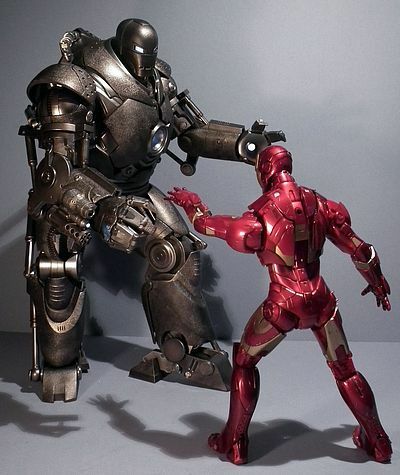 You’ll find he is far more posable than you might initially think, and after acquainting yourself with the limits and range of his engineering, coupled with some gentle manipulation you will find poses you never thought possible. In short I am knocked out by this figure, and when I start to describe the articulation it will become even more evident as to why! The main colour here is a deep wrought-iron colour, veering towards gunmetal grey. It is applied evenly and with good degree of texture pretty much over the entire surface of the exposed panels. Between the rough-cast areas there are smoother panels and details that also have a deep gunmetal or burnt steel finish to them. The matte finish continues inside the canopy when opened with many small details picked out in different finishes. There is even a flash of red and orange colour on the seven rockets attached to the launcher on his left forearm. 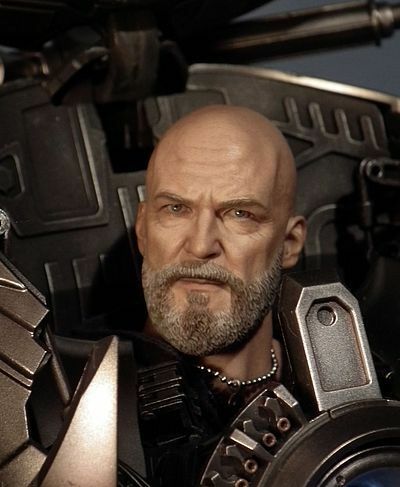 The Obadiah Stane head is also finished to the usual level of perfection. Realistic skin tones, gentle graduations, sparkling glossy wet eyes and beautifully subtle mottling on the greying beard. Nothing at all to complain about here, a fantastic job! 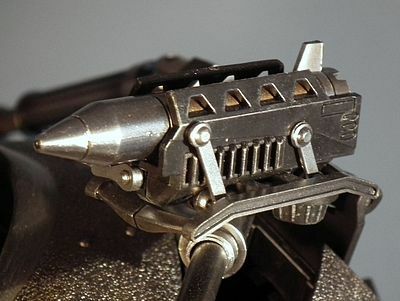 Although packed separately, the Obadiah head shouldn’t really be considered an accessory, as without it there is little point in using the complex mechanism that enables you to flip open the ‘cockpit’ area where the head needs to be attached. I advise you do read the instructions thoroughly before trying to open this feature as the accompanying diagrams explain stage by stage what to do. Firstly the two large panels on either side of the ARC reactor need to be slid out and down, then the wedge shaped panel above the ARC needs to be gently pushed behind the upper canopy before lifting this section and flipping it back. Once out of the way you can see the upper torso and neck of the permanently attached ‘human’ pilot figure within. You just need to place the necklace over the neck, then push the head down onto the post provided. Job done! Once in position you can still close the canopy, just make sure the head is in the correct position aligned with the hollow to accommodate it, then push it down and realign the panels around the ARC. To fit the missile, which is in effect a jumbo version of the ‘ex-wife’ we got with War Machine You must again refer to the instructions. There are two panels on the left shoulder blade that need to be opened to access the extending arm that can be pulled out and flipped down in readiness of delivering its payload. 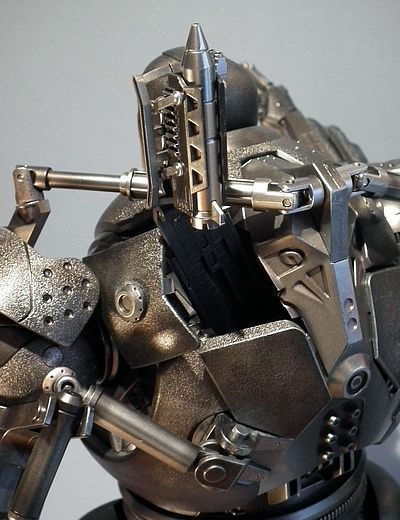 You need to make sure the shoulder pistons are positioned in such a way that this can be achieved. 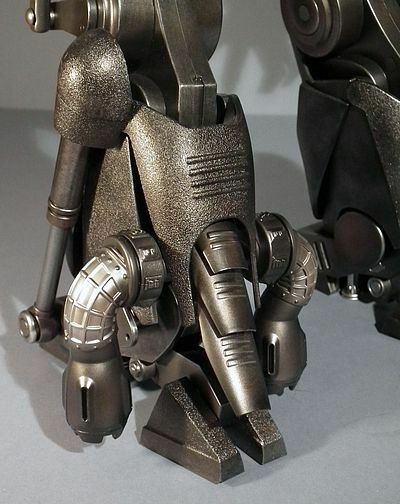 Lastly there are the two sets of rocket boosters that attach to the rear of the lower leg, you just need to lift the panels that are over the rear of the lower leg and extend the armadillo like jointed panels. The rocket boosters can then be attached by means of two pegs on the rockets that align with holes in the legs. I found they attached and were removable with ease. The figure can still stand when they are in position, and although they are a nice extra, I prefer him with the legs in the regular configuration. And I certainly don’t plan to suspend this thing on fishing lines in a flying pose. That’s it, there is no figure stand included, but the figure stands so solidly anyway there really is no need for one. I think when a figure reaches this size and complexity it can be wrong to wish for too much in the way of accessories, as ultimately we don’t want to push the price up any higher than it has to be, so this guy still manages a high score without quite achieving perfection. 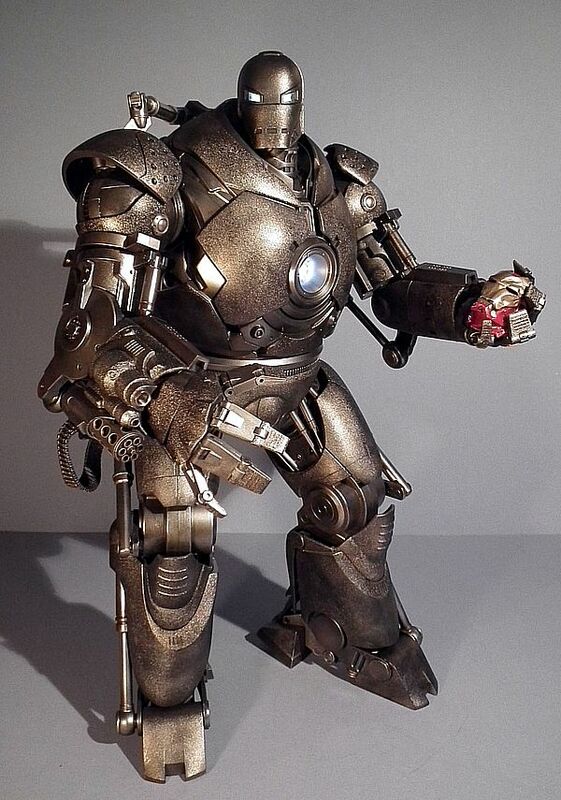 Whoa Nelly, this figure has far… and I mean FAR outstripped my expectations in this category. 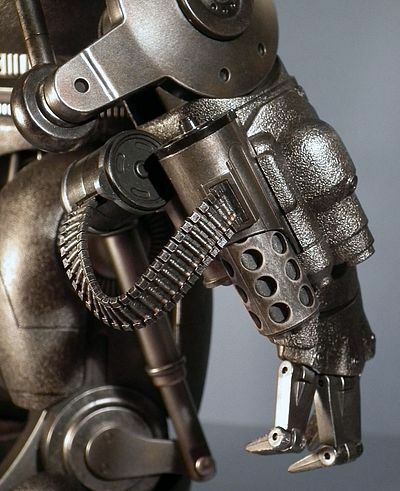 I was hoping that all the engineering we could see in those prototype images would function in some way, but like the T-800 Endoskeleton which I covered here you will find that virtually every bracket, piston and hinge are able to move and respond in much the same way as they did on the CG version seen in the movie. As I said above, you need to take a little time to familiarise yourself with the way the different joints and pistons align, as a desired pose may be easy to achieve with the shoulder pistons facing in a certain direction, but virtually impossible if they are not. All will become clear if you do end up with this in your hands to play with. So, lets try and break this figure down joint by joint as we travel up from those impressive feet. The heel can rock in all directions and the toe and heel are hinged to aid in stepping poses and the outside of the toe area is linked to the upper shin by a working piston. The knee is a large hinge that is also linked to the upper thigh with another working piston. The groin has a rotating cut joint set at a 45 degree angle with a swivelling and rotating second movement concealed within the workings of the thigh. 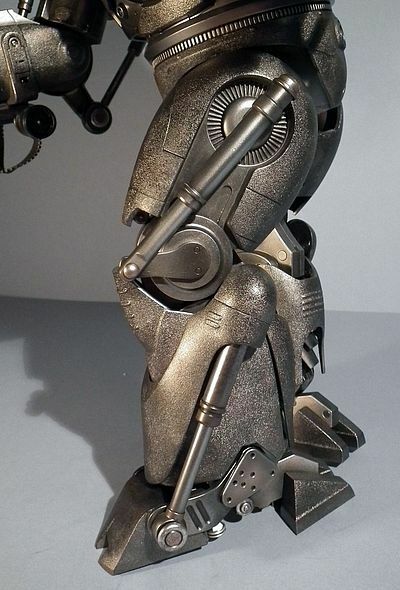 This has an impressive four smaller pistons on each leg set around it that all work and act like mechanical tendons. The waist is also able to rotate a full 360 (which might prove uncomfortable for Obadiah were he really physically set within the suit). Which does lead me to one aside, and its not so much a problem with the model here, but more a general observation of the suits construction were it to be ‘real’. If you have a basic grasp of human anatomy, open the canopy and look at the position of Obadiah’s head it will become clear that he would need some seriously dislocated hips and shoulders to make this suit work! 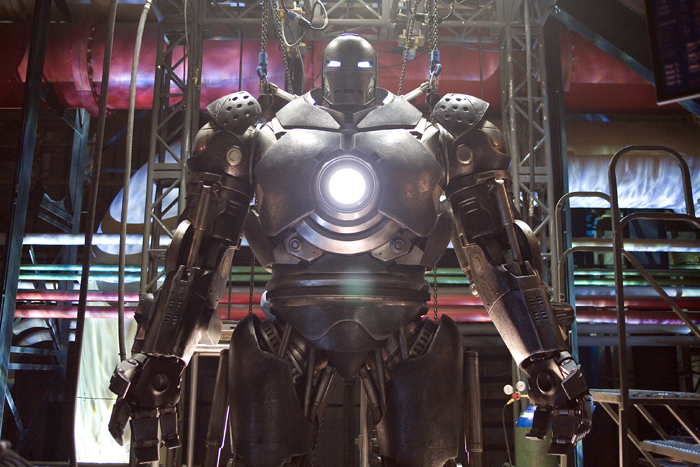 However, this is a figure from a superhero fantasy movie… lets just go with it! 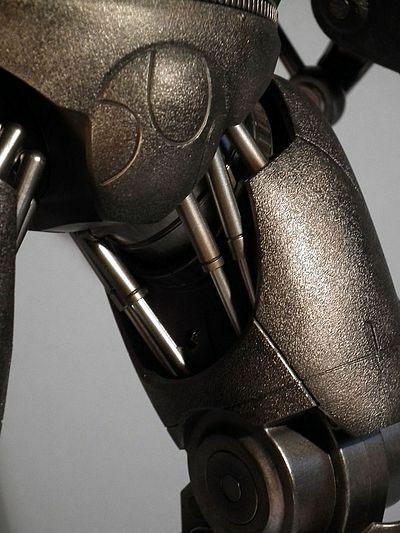 The arms are things of rare beauty, with a universal joint at the shoulder, a cut joint at the mid point of the upper arm that has a limited range because of the two working pistons that are attached to it. Both of these pistons also operate when you open and close the hinged elbow joint below. 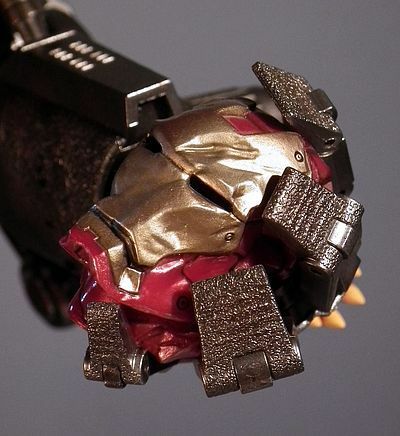 The wrist is a free moving ball joint and each of the fingers has a hinge both where it joins the hand and at the mid-digit point. 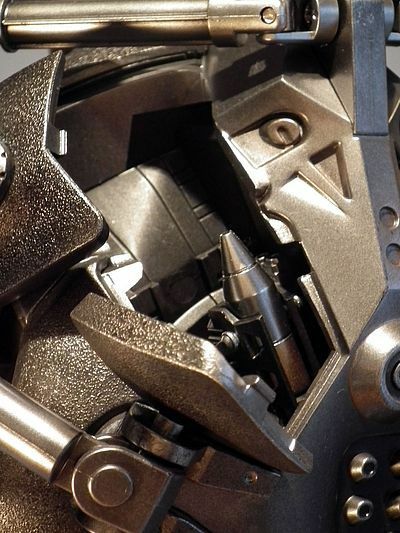 There are also a further two working pistons that join the shoulder mechanism to the lower and upper back. On either side of the back in the ‘shoulder blades’ area are panels that can be flipped open. The right hand one gives access to the battery compartment and light switch, whilst the other side (as I already explained above) opens so you can extend the telescopic rocket launcher up out of its home and flip it forward to display the missile! The front of the chest is also highly engineered and articulated, but again I already explained how it works in the accessories section above. Lastly there is Iron Mongers head, which is set atop the whole thing and is able to turn and tilt to a reasonable degree. There, I think I pretty much covered everything, and it should become plainly apparent to all that this thing is fully deserving a full score, it is just plain AWESOME! 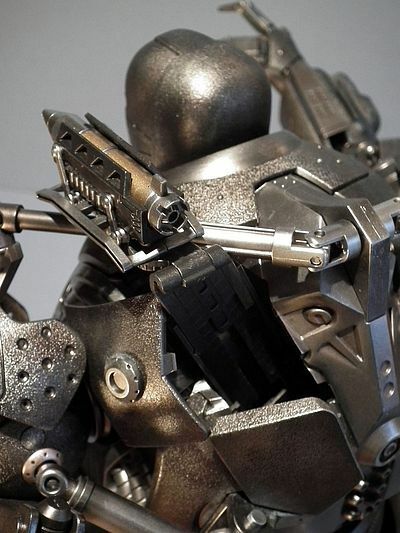 As I alluded to above, this guy doesn’t really have an ‘outfit’ as such, the whole thing is sculpted and engineered. There is the hint of a fabric outfit covering the torso of the Obadiah figure within the main body. It is executed expertly, but to consider it an ‘outfit’ would be a gross miscarriage of judgement! 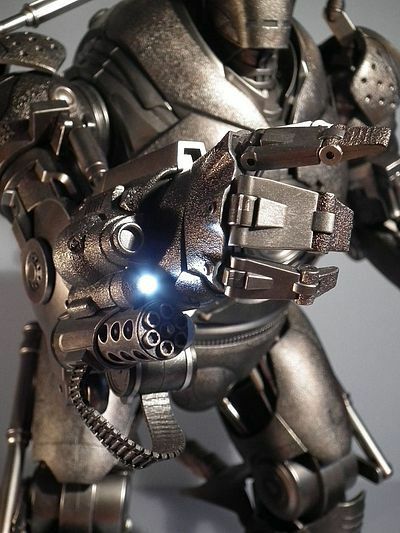 Hot Toys lavish light up features only on the most deserving of cases, and when they do it, they tend to do it well. So far I have been blessed to not receive any figures with major faults, and on examples like the A L I E N Cosmonaut’s, Endoskeleton’s, Astro Boy, various incarnations of the Iron Man power suits, Ghost Rider… and perhaps most spectacularly on the TRON lightcycle I have been hugely impressed, and the feature has enhanced the experience of owning the figures to a great degree. However my respected colleague Mr Eamon O’Donaghue seems to have gotten one with a faulty chest ARC. Hopefully something he can fix or get replaced… but sod him, mines perfect! The palm repulsors both have individual tiny switches to ignite them and the right shoulder blade compartment houses the switch to ignite both the chest ARC and eyes. 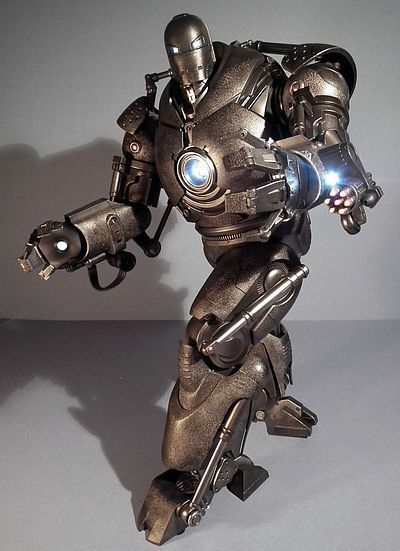 All of them illuminate with a bright ‘icy’ white light and enhance the displayed figure hugely, a great feature. This category is going to be something of a paradox or contradiction if you will. You see for all the praise I want to lavish on this outstanding figure, there is just no getting away from the fact that this has a RRP of $479.99. And it’s hard not to think of that amount in terms of true value for money. 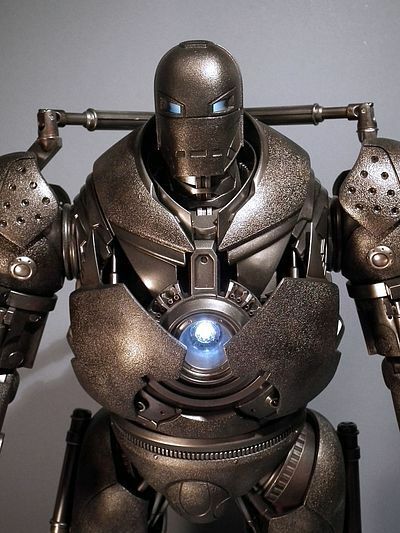 To your average Joe in the street that is an insane amount of money to spend on a toy figure, (albeit one that measures 18” and makes ones soul sing with joy like a choir of celestial angels has inhabited your very soul). And I’m sure the purchasing of it will have caused many a rift in many a family over the Christmas and New Year period of 2012/13 (if those loved ones learnt how much it cost, a secret best not shared). However, this is where the shift occurs in temporal perception to cause my aforementioned paradox! You see to many a 1/6th collector, be they a fan of the movie or not, this signifies something greater than the sum of it’s parts, this is NOT just a ‘new toy’! 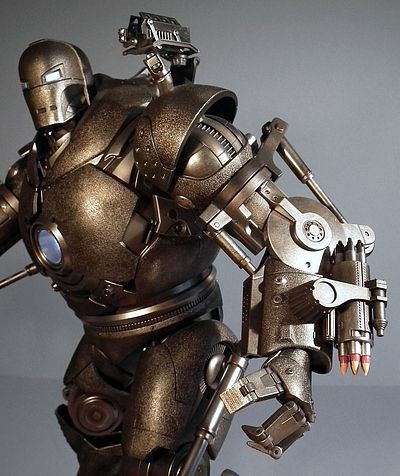 It is another statement of intent from Hot Toys! It spells out that no project is too big or too bold for them, and that if they decide to do something, they will endeavour to do it right. Admittedly we have had some amazing robots delivered from 3A over the last few years, and they look set to keep on delivering. 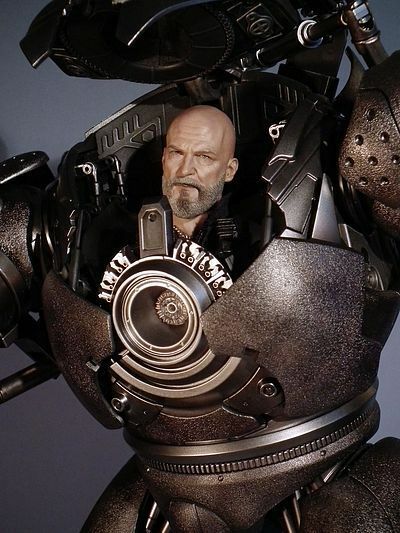 But with its working pistons and supreme engineering on that opening canopy to reveal the uber realistic Obadiah Stane head nestled within, well, what can I say? Yet again another benchmark is set. And to those of us with the addiction… to those of us with this fevered sickness… to those of us with that irrational ‘need’, that price of $479.99 is still huge, but it seems almost acceptable when you look at the R&D that must have been lavished on this behemoth. True you could spend that on two DX figures or even three regular figures, and they might make you just as happy. But for me, personally, this singular piece of work has grabbed my figure of the year with both of it supremely crafted and well-articulated hands in a vice like grip, and it wont let go! Hence my score, which, were I not afflicted with the illness would almost certainly have been at least a star lower… but I am, so it’s not! C’mon, this is the best fun you’re gonna have this year that doesn’t involve a bottle of Absinth and a lost weekend in a hotel in Amsterdam (which would probably cost you less, but result in more legal fees and medical bills). This for me is what collecting toys is all about, and that means it has FUN writ large all over it. Every aspect of this figure is designed beautifully to 100% maximise the fun factor, and that results in an easy full score, with an added ‘+’ for good measure. I fail to see how anyone could handle this figure and not say ‘whoa’ at least once, whilst simultaneously grinning from ear to ear, it’s a masterpiece! I pretty much spelt out my feelings in the value for money category. So even with the price tag (‘it ain’t about the money, money, money’) this manages to pull off that increasingly all elusive perfect score. I guess you could say its based more on a gut instinct than any degree of rational thought. I did try listening to my head, but my head wouldn’t allow a perfect score… it kept wavering between three and three and a half stars. So in the end I let my heart take command and cast the deciding vote, and it voted well! 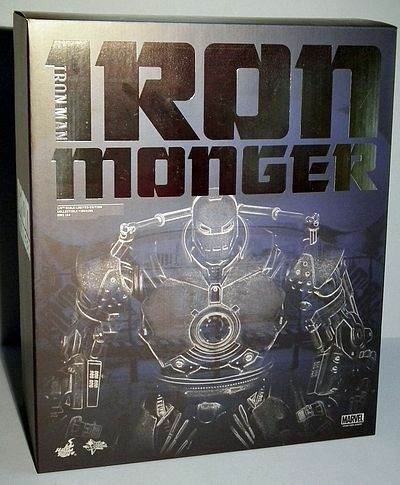 You may want to disagree, and many of you will, but this is a classic example of why I love this hobby, it’s the kind of figure that reaffirms your faith that you have NOT seen it all before, and for that I salute you Iron Monger, you made a cynical old hack very happy! Or you can try eBay where BIN prices are between $450 up to $600, happy hunting!